The more than it is predicted, let’s recall our first semester class of basic electronics and the Intel co-founder Moore’s statement. He said, the number of transistors in a dense integrated circuit doubles approximately every two years. Later this was modified, numbers were added and subtracted from its calculation of the time limit and packed with a ticket of a “LAW”. Things changed rapidly, electronics -the foundation of the whole subject had started to wear an armor of photonics and merged to form a greater innovation, slightly decreasing the essence of Gordon Moore’s Law. Finally when everyone was harmoniously participating in declining Moore’s predictions, Light itself has come to rescue its friend, as per the status derived from the research work accomplished by University at Buffalo’s scientists. A research team consisting of Dr. Liang Feng, assistant professor in the Department of Electrical Engineering and his associates have found a greater hope in a vortex-like optical tool for data transmission that can support Moore’s law. As reported earlier, the world has taken a shelter beneath the heavy attire of optics and photonics which would now pay off the effort, not breaking the synchronization achieved earlier. Yesterday, they were again held responsible for the next generation computers specially optimized to process the growing demand of information sharing. According to the team, with the help of their new technology the computers would become smaller, faster and cheaper, ultimately saving the theory from getting doomed. The real “life potion” lies in the concept that more data will be transferred at an expense of less energy and for that, they required a design change when compared to any contemporary machine. For decades, the instruments were made compact, constantly decreasing the size and increasing the complex circuitry. The laws and the forthcoming prediction was what we cherish now as an application seen on our smartphones, laptops, and related gadgets. However, to meet the growing demand of technology, the world had to shift from electronics to the Einstein’s special theory of relativity’s spin-off – the ultimate speed of light. And this was the turning point when fiber optic cables and light based communication was mapped to commemorate the growing demands. The research team highlighted that the LASERs, being one of the most required coherent optical sources has been an integral part since optical communication network had initiated its journey. With each step, it grew as a transmission channel most suited for funneling different signals into one path, which carries a fat amount of information using wavelength-division and time-division multiplexing techniques. However, all these processes and techniques are now on the verge of saturation leading to a constant impulse of requirements. 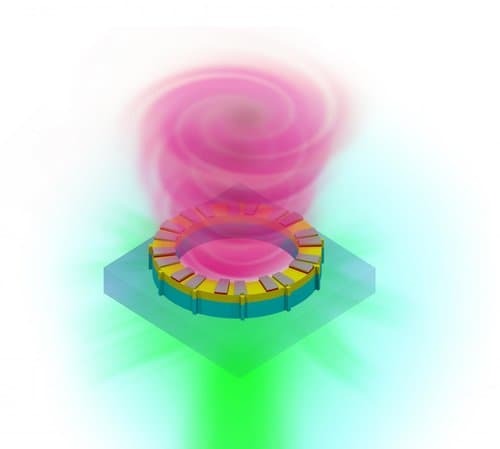 As an alternative and probably the next generation solution, the research team has devised a light manipulation technology scientifically termed as Orbital Angular Momentum Lasing (OAM). If incorporated at micro-nano scale, this could invasively load the channel with an unimaginable amount of information. This whirlpool of information has a basic size that would not be compatible with today’s computer chips. To change the consequence, the size experienced a shrink so that it manages to communicate with the computer chips. As the laser beam is transformed into a corkscrew-patterned vortex, it carries 10 times more information than linearly directed Laser. As confirmed, Vortex Lasers have already made it to the advanced transmitters and receivers and would soon be the primary component of high-quality data centers and computers. The research was supported by U.S. Army Research Office, the U.S. Department of Energy and National Science Foundation and has been published in the journal “Science”. Want to see an optical illusion that comes free with this article? Check the image below. 1. First look at the image for few seconds. 2. Then look at the white screen, with no image just beside the image or top of the image. 3. 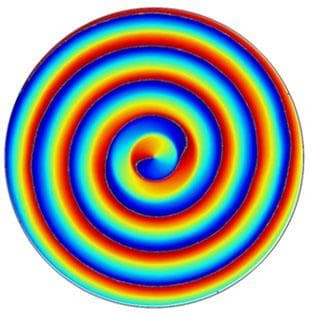 You will see the vortex appearing in the white section. Very informative. Thoroughly enjoyed it!